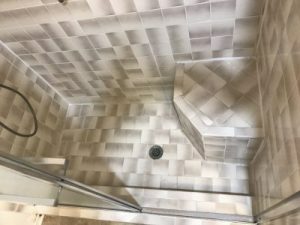 Safe Showers is the bathroom remodeling company that homeowners throughout the San Antonio, Texas, area turn to when they need to make their bathrooms safer to use for relatives who are aging in place, disabled, or who have other mobility limitations. If you have an old bathtub that poses a safety risk due to its high basin wall, we’d be happy to replace it with a roll-in shower for easy wheelchair access. With low- or no-wall options, a roll-in shower from Safe Showers virtually eliminates the need for having to step over a tub wall, making it much easier to enter and exit than a traditional tub. Three conveniently placed grab bars will allow you to keep your balance at all times and, thanks to the only truly slip-resistant floor in the industry, the risk of a slip-and-fall accident will be greatly minimized. One of the benefits of partnering with Safe Showers is that we’ll include a bathing chair with your project for free – most other bathroom contractors charge extra for this feature – so that your roll-in shower can be used by wheelchair-bound loved ones. Our team members have installed countless easy-access showers for homeowners in San Antonio, TX, and surrounding areas. As such, their craftsmanship can’t be matched. We are 100 percent dedicated to helping our customers live comfortably and independently in their homes, which is why we offer top-quality shower systems for affordable prices. And, we’ll back all of our work with a one-year warranty, on top of the lifetime warranty that comes with your new roll-in shower. For more information about having a roll-in shower installed to make your bathroom safer to use for a loved one, contact Safe Showers today. We are the go-to bathroom-safety experts serving San Antonio, Austin, and the Texas Hill country.